How To Add A Logo To Your LinkedIn Profile! Here’s how to jazz up your LinkedIn profile by adding logos of the companies you’ve worked for. The small bit of colour helps. It’s quite easy to do. Want to find out how to add a logo to your LinkedIn profile? But first, before you do anything, go to your LinkedIn settings, and switch the privacy controls to OFF for activity broadcasts. The first time I did this, I overlooked that and in the following days, kept getting congratulations from kindly minded people about my ‘new’ job. (Every job you edit shows up in your feed as a new role!). To add company logos to your LinkedIn profile, just follow these simple steps. 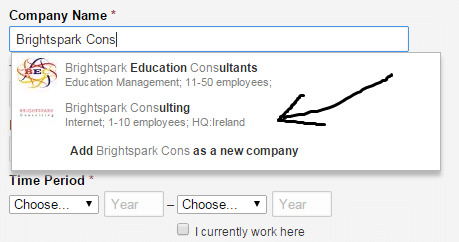 Step 1: Scroll down to your employment history, and click the edit button on the right. These are all businesses that have registered LinkedIn pages. If your company is there, you can select it. Step 4: Once you’ve completed the form, hit Save. Your logo should automatically appear beside the detail. There you go! If the company you are looking for doesn’t appear on the dropdown list, then it needs a company page. If it’s your company, you can create one in a couple of seconds. That is the only way (right now) that LinkedIn allows you to display company logos on your profile. If you’re working for a company however, you need to request from them to add a logo. Thoughts? It makes sense and means there aren’t going to be any incorrect logos floating around. It does mean though that if you work for a company that closed down before making a profile, you simply cannot add a nice shiny logo. But hey, that’s a #firstworldproblem. Fancy a quick chat? Schedule a 15 minute call with us. Let’s chat about LinkedIn, social selling, or anything else on your mind.